Six men and two women have died in a crash involving a minibus and two lorries on the M1 near Milton Keynes. All of those who died were travelling in the minibus, which was from the Nottingham area. A five-year-old girl, a woman and a man are being treated in hospital with life-threatening injuries, while another woman has serious injuries. The two lorry drivers have been arrested, one of them on suspicion of driving while over the alcohol limit. The crash happened on the southbound M1 at Newport Pagnell in Buckinghamshire just before 03:15 BST. South Central Ambulance Service said those injured in the collision were taken to hospitals in Milton Keynes, Coventry and Birmingham. Police said some of those involved in the collision were visiting the UK from India. The vehicles were all travelling in the same direction between junctions 15 and 14, police said. 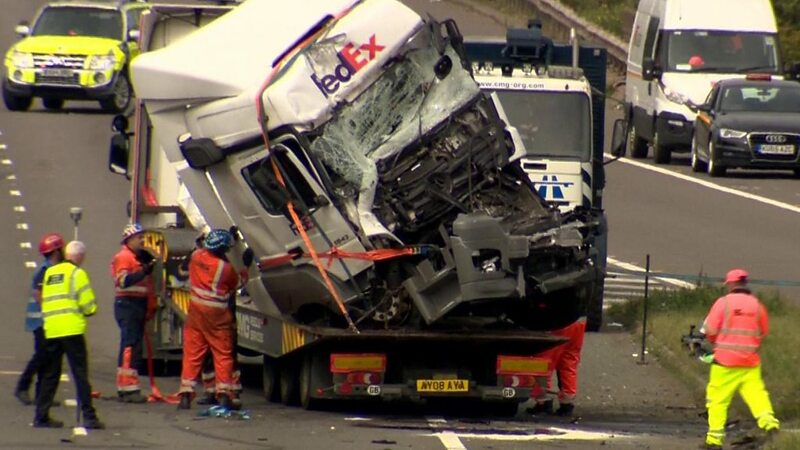 Pictures appear to show extensive damage to the lorries involved – a FedEx vehicle and one belonging to AIM Logistics. Ismail Elmagdoub, director of AIM Logistics, based in Evesham, Worcestershire, said: “One of our vehicles was involved in a serious incident on the M1 southbound, junction 14 this morning at approximately 3am. “We would like to express our deepest sympathy to the families who have lost loved ones and also those whom have been injured at this very sad time. The road was closed for several hours while investigation work took place.